We’d love your help. Let us know what’s wrong with this preview of Marcel Proust's Search for Lost Time by Patrick Alexander. An accessible, irreverent guide to one of the most admired--and entertaining--novels of the past century: Rememberance of Things Past. There is no other guide like this; a user-friendly and enticing entry into the marvelously enjoyable world of Proust. At seven volumes, three thousand pages, and more than four hundred characters, as well as a towering reputation as a litera An accessible, irreverent guide to one of the most admired--and entertaining--novels of the past century: Rememberance of Things Past. There is no other guide like this; a user-friendly and enticing entry into the marvelously enjoyable world of Proust. To ask other readers questions about Marcel Proust's Search for Lost Time, please sign up. I'm not entirely sure why this book was written. It comes off as a slightly heftier Cliff's Notes version of In Search of Lost Time, with the bulk of the pages devoted to plot synopses and character descriptions. To devote so much space to the plot and characters of Proust is to miss the point entirely. While this might be useful as a bedside reference to help sort out the numerous characters in Proust (and for that reason I gave it two stars instead of less), it falls far short of the ground co I'm not entirely sure why this book was written. It comes off as a slightly heftier Cliff's Notes version of In Search of Lost Time, with the bulk of the pages devoted to plot synopses and character descriptions. To devote so much space to the plot and characters of Proust is to miss the point entirely. While this might be useful as a bedside reference to help sort out the numerous characters in Proust (and for that reason I gave it two stars instead of less), it falls far short of the ground covered in works such as Proust's Way: A Field Guide to In Search of Lost Time that actually put effort into analysis of the text and not merely synopsis. This is a great, non-academic guide to Proust. The book summaries, character descriptions, and background information are presented in clear language and logical order designed for the "readers" of Proust rather than for "researchers". Confirmed in my opinion that this book is a great support for Proust without having to become a Proust-scholar to understand it. Having gone through the book twice now, I feel well-prepared for the 2013 year of reading Proust. Will also be looking This is a great, non-academic guide to Proust. The book summaries, character descriptions, and background information are presented in clear language and logical order designed for the "readers" of Proust rather than for "researchers". I enjoyed this companion read to Proust's Remembrance of Things Past. I would read a book by Proust, read the chapter in Patrick Alexander's book, etc. If I lost track of a character, I'd check the character list in this book. After finishing Proust, I read the sections on the history of France at the time of Proust, the Dreyfus Affair and Paris in the time of Proust. This is an interesting and informative addition to reading Proust. Since reading Proust can take years, this guide provides a useful summary of the books and characters which can serve as a "refresher" between books. I am just about to start book 4, and it's been months since I finished book 3, so the book summaries were a good reminder of "the story thus far.". The short biography and background chapters are also useful. On the whole, though, there aren't any great or even new insights here. Mary Ann Caws book covers most of the same info found in these backgr Since reading Proust can take years, this guide provides a useful summary of the books and characters which can serve as a "refresher" between books. I am just about to start book 4, and it's been months since I finished book 3, so the book summaries were a good reminder of "the story thus far.". The short biography and background chapters are also useful. On the whole, though, there aren't any great or even new insights here. Mary Ann Caws book covers most of the same info found in these background chapters with more useful insights and fantastic illustrations. A very useful reference for those like me who keep forgetting who's who and miss things because they lose track of what is going on by the time they get to the end of one of Proust's long sentences. If I was able to maintain focus and read all of Remembrance of Things Past consecutively, maybe I wouldn't need such a guide. But If you're like me and tackle the novels with significant time in-between, then the character outlines, plot synopsis, contextual points and suggestions for further reading A very useful reference for those like me who keep forgetting who's who and miss things because they lose track of what is going on by the time they get to the end of one of Proust's long sentences. If I was able to maintain focus and read all of Remembrance of Things Past consecutively, maybe I wouldn't need such a guide. But If you're like me and tackle the novels with significant time in-between, then the character outlines, plot synopsis, contextual points and suggestions for further reading in this guide are invaluable. Very easy to digest. I wish that I had read this before I read The Remembrance of Things Past. The author provides an excellent summary of the plot, as well as detailed descriptions of each character, and insight into Proust's Paris and the relationship of his book to French history. Now I want to go back and read The Remembrance of Things Past again. Useful to a total newcomer to Proust, and the Character guide a definite plus as one wends one's way through the great work, but as to content, not so hot. Entertaining, and provided some context as well as the idea that things said in one part of the book recur later with more meaning (so you need to pay attention). I might have to take it out of the library again if I ever try to read Lost Time again. His summary of the story reminds me why I only liked the first and last volumes, though. Proust is the last of the great writers I have struggled with, and having given up several times, I turned to this guide book for help. So far it seems to be working as I'm 120 pages into Proust and surviving. This book has been very helpful, particularly getting through the Overture. I thought it would be full of spoilers (which was why I resisted this approach) but in fact it is not. Anyway if you can't get through or get started with Proust I highly recommend this book. Under the spell of À LA RECHERCHE DU TEMPS PERDU since closing the last volume of the series. Haven't found a book as satisfyingly dense, as creative, as generous, since then. Start a book, leave it, start another, drop it. You know the feeling. Then I found the magical MONSIEUR PROUST'S LIBRAIRY, and now, this wonderful overview of the entire TEMPS PERDU. While I doubt this book can serve as an introduction to Proust's masterpiece for someone who has not read it (too many references to events a Under the spell of À LA RECHERCHE DU TEMPS PERDU since closing the last volume of the series. Haven't found a book as satisfyingly dense, as creative, as generous, since then. Start a book, leave it, start another, drop it. You know the feeling. Then I found the magical MONSIEUR PROUST'S LIBRAIRY, and now, this wonderful overview of the entire TEMPS PERDU. While I doubt this book can serve as an introduction to Proust's masterpiece for someone who has not read it (too many references to events and characters), it is the perfect validation and security blanket needed by readers such as myself, completely at loose ends after having run the gamut of reactions and feelings to what is probably the world's greatest read! 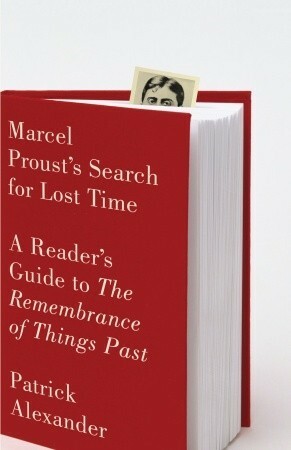 This reader's guide is the Coles Notes that Marcel Proust's masterpiece requires. Very well done. It's important to note this is a reader's guide, not an analytical book, as Alexander notes in his commentary, he restricts himself (more or less) to the narrative sides of things. If you're looking for a bit more of a scholarly analysis ,read David Ellison's Reader's Guide, and then go to Roger Shattuck and the other books of essays. But this is very nicely done, particularly with a list of places and characters in the second half. More importantly, this is a clear and concise p Very well done. It's important to note this is a reader's guide, not an analytical book, as Alexander notes in his commentary, he restricts himself (more or less) to the narrative sides of things. If you're looking for a bit more of a scholarly analysis ,read David Ellison's Reader's Guide, and then go to Roger Shattuck and the other books of essays. But this is very nicely done, particularly with a list of places and characters in the second half. More importantly, this is a clear and concise precis of the books - perhaps best suited to people who either aren't able to read the whole thing, or feel daunted by the piece. The other books on this subject are all fairly "academic"even when they're not trying to be, so this one is a sure bet for the novice reader! This has proved an invaluable companion to my reading of Marcel Proust's 'In Search of Lost Time' from March onward. I was especially grateful for his 'Who's Who in Proust' to assist me in keeping track of the many characters as well as to appreciate its themes. I was quite disciplined in not reading ahead in the detailed summaries of each volume and read them after I'd completed the book. Not bad. I didn't use the summary while reading (thank goodness--too many spoilers), but did read the short part on historical context at the end of this guide prior to reading "In Search of Lost Time." (Not knowing French history, the discussion of the Dreyfus Affair paid off immensely for reading the novel itself.) I did read the guide after completing the novel, and it was a nice summary. Very good introduction to "Remembrance of Things Past". I use this guide to remember characters and situations when I resume reading this huge book: it contains very practical summaries for each of the 7 volumes, characters list and connections between them. Excellent companion book to be read with In Search of Lost Time. This helped me understand the various themes and motifs of the novel. I found it be insightful and extremely helpful! A nice reference, but a bit repetitive at times. Some scenes are described with the same words in as many as three different places. If you're going to read Proust, this book contains a good summary of the Dreyfus Affair, which will come in handy. Very helpful, well structured guide and collection of resources to assist and inspire the student of Proust. A brilliant & concise introduction to the world of Marcel Proust - I am now fully geared up for the plunge! Helpful. Well organized. Clearly written. Takes an immense novel and breaks down plot and description of characters concisely.